Destroy the vampire before it turns its allies. Travel to radiant location: a bandit camp or warlock lair. Destroy the vampire before it turns its allies into vampires. You will be asked to kill a vampire before it turns its allies. When hunting the vampire, it will be at a random location, either a bandit camp or warlock lair. This can include locations added by official add-ons. The vampire you are sent to destroy, and its "allies" you are supposed to save, do not appear in the radiant destination location. This has been widely reported, and in a number of locations. It likely affects all locations. The objective "Kill the (Vampire) at (dungeon)" will remain active. Waiting 24 hours can fix this. 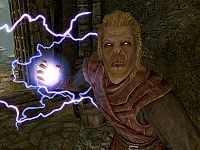 If Silver Hands occupy the target dungeon, they will kill the vampire before you can reach it and the quest will instantly complete upon entering the dungeon. 10 Gunmar has sent me to <Alias=Dungeon> where I am to destroy the <Alias=Vampire> before it turns its allies into vampires. 255 Finishes quest Gunmar sent me to <Alias=Dungeon> where I destroyed the <Alias=Vampire> before it could turn its allies into vampires. On the PC, it is possible to use the console to advance through the quest by entering setstage DLC1RH03 stage, where stage is the number of the stage you wish to complete. It is not possible to un-complete (i.e. go back) quest stages, but it is possible to clear all stages of the quest using resetquest DLC1RH03. Esta página foi modificada pela última vez à(s) 17h35min de 15 de março de 2014.